Summer temperatures on the South Rim, at 7000 feet (2134m) are relatively pleasant 50s-80s°F (10°-20°C). Thunderstorms frequently occur during July, August, and early September. Inner canyon temperatures are extreme. Daytime highs at the river, 5000 feet (1500m) below the rim, often exceed 105°F (40°C). Winter conditions on the South Rim can be extreme. Be prepared for snow, icy roads and trails, and possible road closures. Roads on the South Rim are plowed when needed. Canyon views may be temporarily obscured by fog during passing storms. Spring and fall weather is unpredictable. Be prepared for sudden changes in the weather at those times of year. May and October can be some of the driest months, although snowstorms may occur. Late April and May can be windy. Spring and fall can be the best times to be hiking in the canyon. The Grand Canyon is more than a great chasm carved over millennia through the rocks of the Colorado Plateau. It is more than an awe-inspiring view. It is more than a pleasuring ground for those who explore the roads, hike the trails, or float the currents of the turbulent Colorado River. This canyon is a gift that transcends what we experience. Its beauty and size humble us. Its timelessness provokes a comparison to our short existence. In its vast spaces we may find solace from our hectic lives. The Grand Canyon we visit today is a gift from past generations. Grand Canyon National Park, a World Heritage Site, encompasses 1,218,375 acres and lies on the Colorado Plateau in northwestern Arizona. The land is semi-arid and consists of raised plateaus and structural basins typical of the southwestern United States. Drainage systems have cut deeply through the rock, forming numerous steep-walled canyons. Forests are found at higher elevations while the lower elevations are comprised of a series of desert basins. 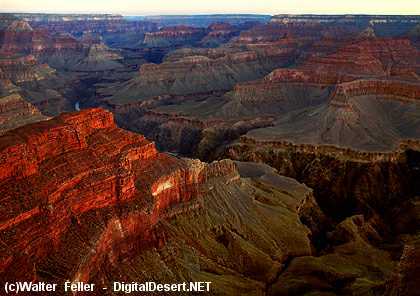 Well known for its geologic significance, the Grand Canyon is one of the most studied geologic landscapes in the world. It offers an excellent record of three of the four eras of geological time, a rich and diverse fossil record, a vast array of geologic features and rock types, and numerous caves containing extensive and significant geological, paleontological, archeological and biological resources. It is considered one of the finest examples of arid-land erosion in the world. The Canyon, incised by the Colorado River, is immense, averaging 4,000 feet deep for its entire 277 miles. It is 6,000 feet deep at its deepest point and 15 miles at its widest. However, the significance of Grand Canyon is not limited to its geology. The Park contains several major ecosystems. Its great biological diversity can be attributed to the presence of five of the seven life zones and three of the four desert types in North America. The five life zones represented are the Lower Sonoran, Upper Sonoran, Transition, Canadian, and Hudsonian. This is equivalent to traveling from Mexico to Canada. The Park also serves as an ecological refuge, with relatively undisturbed remnants of dwindling ecosystems (such as boreal forest and desert riparian communities). It is home to numerous rare, endemic (found only at Grand Canyon), and specially protected (threatened/endangered) plant and animal species. Over 1,500 plant, 355 bird, 89 mammalian, 47 reptile, 9 amphibian, and 17 fish species are found in the park.